The movie opens with Indiana Jones (Harrison Ford), an archeologist, hunting for a golden statue in the Peruvian jungle in 1936. He dodges some deadly traps and miraculously escapes. Back in the US, the government seeks his help in recovering The Ark of the Covenant, the powerful chest bearing the Ten Commandments, in Egypt. He sets on a journey to find it. However, he will have to fight his arch nemesis Dr Renee Belloq and a band of Nazis before that. Jeff Bridges turned down the role of Indiana Jones. Six months after the rage virus was inflicted on the population of Great Britain, the US Army helps to secure a small area of London for the survivors to repopulate and start again. But not everything goes to plan, when a carrier of the same virus enters London and unknowingly re-ignites the spread of the deadly infection. Danny Boyle couldna��t direct the sequel because of his commitments to Sunshine. 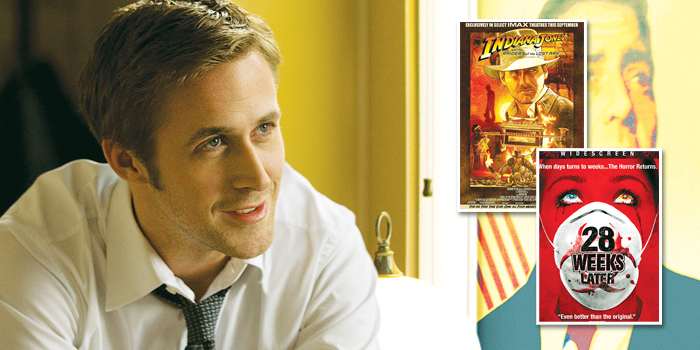 Stephen Meyers (Ryan Gosling), a young idealist, is brilliant at communications. He is second in command on Governor Mike Morrisa�� (George Clooney) presidential campaign. In the middle of the Ohio primary, the campaign manager of Morrisa�� opponent offers Meyers a job. At the same time, Morrisa�� negotiations for the endorsement of the man in third place, a North Carolina Senator, hits a snag. Leonardo DiCaprio dropped out of the role of Meyers, but stayed on as executive producer through his company, Appian Way.